With the new latest craze of the escape room game comes the mass production of items so players can enjoy it at home! 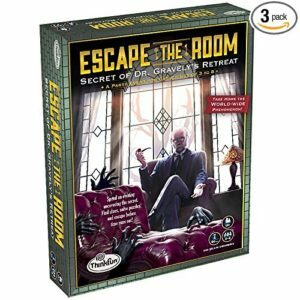 Escape room games in a box are popping up on store shelves everywhere now, from games stores to child education stores to Amazon galore. I’ve only tried out one so this list isn’t intended as reviewed games, simply a list of available and soon to come games. This escape room game advertises itself as being for 3-5 players and includes 4 – that’s right 4! – different themes all in one. This game appears to have a built in timer which is great for increasing game immersion. Nothing like checking your cell phone to see how much time you have left. This is the at-home escape game I have played, and my friends and I had fun and had “escaped” in under 1 hour. Although we did find we were peering over each other shoulder’s a fair amount. But this is typical of even your standard escape room game. This escape room game is a mystery, and players need to solve it before time runs out! It recommends 3-8 players which is a pretty wide range, but I suppose for a party game that makes sense. Hard to design for that range of players though. Lots of paper/card used in this game and it’s not entirely replayable as you need to rip open envelopes as you solve things. This was one of the first games I saw come to market and appears to stand up well despite many other companies appearing on the scene with their own version. It is often recommended by reviewers and escape enthusiasts. Retails for ~$20 US from Amazon. 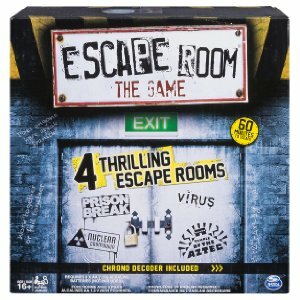 The second variation of the Think Fun brand, this escape room game sees you and your fellow players “trapped” in some sort of a “health retreat”. You need to figure out what mysterious evil is going on and try to escape! Presumably, before you get killed in some awful spa burrito sauna incident. Again, this game is recommended for 3-8 players though I’d recommend something like 3-5 based on my experience with the first one. 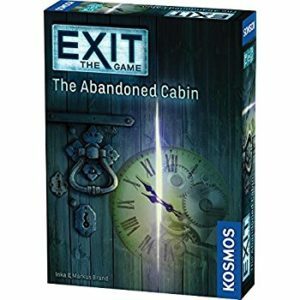 A fairly new product, Thames & Kosmos produces a wide variety of educational products/toys and has entered the escape room game industry with their Exit series. Retails for ~$15 US on Amazon. The games recommend 1-6 players, which, c’mon guys. That’s not really a party game then? They also state explicitly that the game is not playable more than once, as pieces may be destroyed during the game. Sounds familiar, doesn’t it? 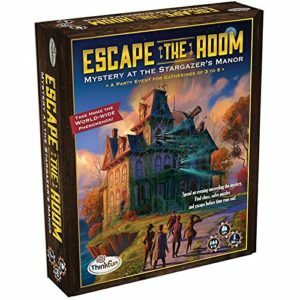 Sticking to the cliched yet enjoyable real life escape room game themes, these at-home escape room games might have similar concepts or design mechanisms but involve more paper.